I'm afraid I sort of have to "phone it in" in terms of a post for today because I'm having a bit of a health issue this week. Nothing serious, I'm sure, but I'm just at that point where I know rest is better than blogging this week. 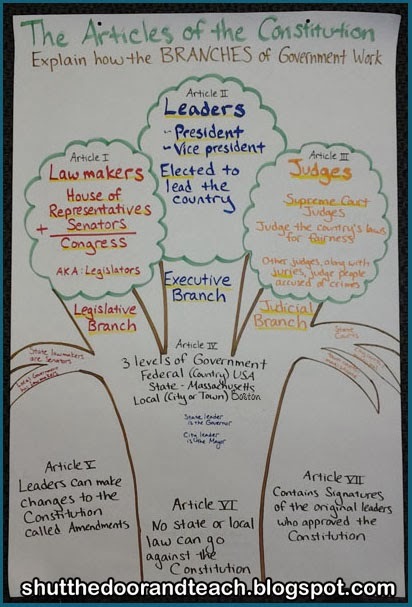 So in this post I'm going to quickly share an anchor chart I made and used with my class on Constitution Day, September 17. It was a big hit, and I hope it helps your class next year! Great anchor chart! And I hope you feel better soon! Thanks, Deb. :) Still not doing well; I've done something to my back and been in a lot of pain all week. It's actually worse sitting than standing so I can work just fine; it's leisure time on the computer here that is the problem! Thanks for linking up! I love the anchor chart and how the illustration goes along with the purpose! What do those lower Judicial Branches say?